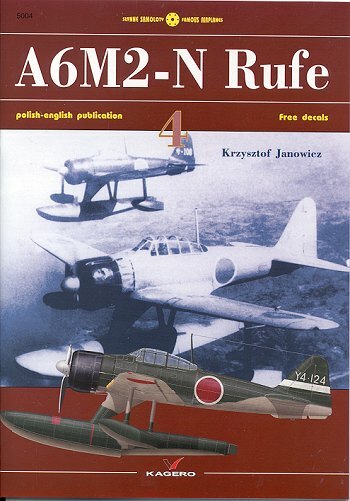 #4 in Kagero's Famous Planes series is on the A6M2-N 'Rufe'. The only nation during WWII to actively use fighter floatplanes was Japan. This was seen as a need because they were not only unable to build airfields as quickly as the fames Seabees, but many times, there was not time or the location was such that airfields were not possible. As a result, a tender went out for a floatplane fighter that was won by Kawanish for its N1K1 'Rex'. However, development problems delayed the project so much that a substitute was sought and that resulted in developing the Mitsubishi A6M2 into a float plane. This was done by Nakajima as Mitsubishi's production lines were already at maximum building the Zero. This book covers the development and design of the Rufe and provides detailed construction information. It isn't until the second half of the book that we get into the combat use of the aircraft. Broken down into several areas of combat, this tells the tale of what is truly a unique aircraft that was used throughout the Pacific from the Aleutians to the Solomons. Finding photos of the Rufe isn't easy and the author has managed to collect quite a few for his book. 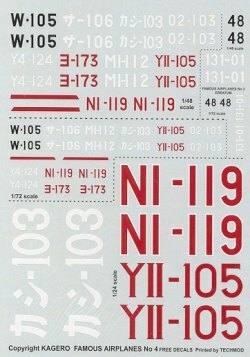 There are also the excellent color profiles and, as has become the norm with Kagero books, there is very nice decal sheet covering the profiles. These are provided in 1/24, 1/48 and 1/32 scale. In fact, one wonders if this is a nice monograph with decals or a decal sheet with excellent reference material! Regardless, I think you'll find this to be an interesting read on an aircraft that doesn't get a lot of press.